Molnlycke Hibiclens Antiseptic Antimicrobial Skin Cleanser from HealthyKin.com can be part of an effective defense for preventing the spread of MRSA. Its active ingredient works in a unique way — it kills germs on contact and bonds to the skin to keep killing microorganisms up to 6 hours after washing. Hibiclens has been proven to kill MRSA (in vitro) and other staph infections. 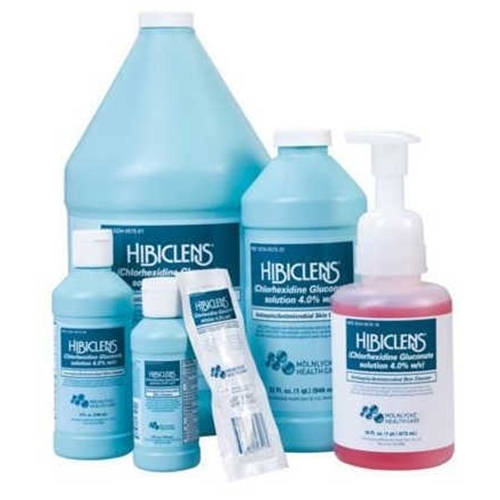 Molnlycke Hibiclens Antiseptic Antimicrobial Skin Cleanser contains 4% w/v chlorhexidine gluconate, a chemically unique cationic bisbiguanide with inactive ingredients: fragrance, isopropyl alcohol 4%, purified water, red 40, and other ingredients, in a mild, sudsing base adjusted to pH 5.0-6.5 for optimal activity and stability as well as compatibility with the normal pH of the skin. Same product as other places, at about 1/4 the price! Thank you! This Company deserves to be well-known, not only for the high quality medications it provides, such as Hibiclens Antiseptic , but also for the speedy delivery right to my condo front door H.D. Great product and terrific service!! So worth the money! Love this product! We have been very happy with the product. great germicidal soap, however, it does leave a stain on the washcloth, but I was able to get it out.